War and good health are not typically things that go together, although in the case of chlorella there is actually a link. Today, raw chlorella tablets are known as an amazing superfood but it also has an equally amazing history. In an ironic way, we can thank World War II for helping chlorella attain its recognition as one of the modern-day superfoods, according to the American Cancer Society. When rations were thin and nourishment low, the microscopic algae chlorella caught people’s attention for its high rate of protein and its ability to grow at an astounding rate. Enter the nuclear disasters of Nagasaki and Hiroshima, and chlorella got a second boost for its usefulness and popularity for its apparent ability to help folks in the aftermath. 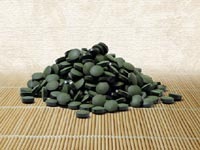 Research at the time showed chlorella boosted the body’s power to purge out toxins such as uranium, lead and cadmium. If chlorella can help flush out toxins in the wake of nuclear disaster, you can imagine what the superfood can do for the less intense toxins your body encounters daily. So what is this dandy superfood and how can it can help you? Chlorella is a type of freshwater algae that’s harvested and transformed into supplements. The super-detox powers of the algae come from its high levels of the antioxidants beta carotene and Vitamin C. These antioxidants fight fiercely against the free radicals that like to come in, mess up your cells and prematurely kick off the aging process. In addition to its bountiful protein content, chlorella is a stalwart source of carbohydrates, fiber, chlorophyll, fats, minerals and vitamins. Some of the most notable include iron, B-complex vitamins and magnesium. The Chlorella pyreneidosa strain of the algae, also known as the “King of Chlorella,” additionally contains major levels of CGFs, or chlorella growth factors. WebMD reports CFGs are extracts of chlorella that dissolve in water and contain loads of proteins, peptides, amino acids, sugars, nucleic acids and vitamins. CGFs can replenish the body with nutrients and activate cells that help fend of bacteria, viruses and cancers. 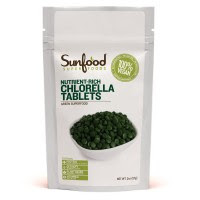 With all that good stuff going on, it’s only natural chlorella tablets comes with a potential outpouring of benefits. The small but powerful “king” may also be good for the skin, with additional uses that include skin rashes caused by radiation treatments and skin ulcers that come about from any source. And you don't have to wait for World War III to give this nutrient-rich supplement a whirl.